1. Lithium battery can work last for 4 to 5 hours. 2. Four way bending any viewing angle can be exhaustive. 3. Intelligent snapping recording, the detection of data records in time. 4. It can support 32GB SD Card (max), Standard: 8GB. Documentation made easy with the new RIDGID micro CA-300 Inspection Camera, the next evolution of the micro explorer. Easily record still images and videos of problems in hard-to-reach areas and save these on the internal memory (235 mb) or the included 4 GB SD-card. - Resolution: HD 640 x 480, 1280*720(only on PC). - View Angle: 66 degrees. - Light: 6 adjustable withe LEDs. Vedio Scopes are used to inspect inside small areas such as gas turbines, automotive engines, castings, machined parts, valves, small diameter piping, gear boxes, compressors and law enforcement. A Vedio Scope allows engineers to check for pitting, cracking, corrosion, erosion, weld and other defects, thus minimizing downtime and reducing unnecessary maintenance. Rugged and versatile video borescope with intuitive handset controls for clear images in tight spaces. Scholly Fiberoptic Gmbh, Germany are manufactures of inspection systems based on optical fibers and "state of the art' lens designs. 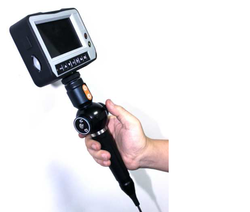 Boroscope / Videoscope is an instrument which is used for the inspection of piping internal surface and weld joints. It is the current pharmaceutical industry practice to use boroscope for documentation of orbital welding joints for inspection. Normal Practice is to do 10% of Boroscopy / Videoscopy of the total welding joints and 100% in critical application. 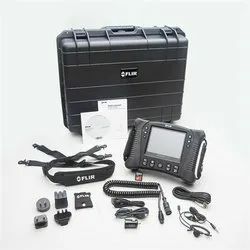 - High-End Video Borescope with Added Functionality. - Joystick-Controlled, 360 ° Articulation. - Highly Durable and Flexible Insertion Tube.